For the first time in 14 years, since 1993, the 50th state of the United States hosted a jungyo. This foreign tour was held in Hawaii from the 7th to 11th of June. Due to the time difference, while the locals could enjoy two tournament days during the weekend, the Japanese watched them on Sunday and Monday. Judging from the ticket sales, which were boosted by Hakuho's promotion, the tournament would start well. It was, in fact, the first occasion to see the two yokozuna perform. Two tournaments were scheduled to take place in Neal S. Blaisdell Arena in Honolulu: the Mayor of Honolulu Cup on Saturday and the Governor of Hawaii Cup on Sunday. Both were direct elimination tournaments. If two different wrestlers should win the Cups, an extra bout would be held at the end of the second day to decide the winner of Sakura Cup, trophy of the overall tournament. We remind you that the results from jungyo tournaments do not influence the banzuke. Some 97 persons, 38 of them makuuchi division wrestlers (among them Miyabiyama, who would learn of his mother's death that same day) left on the evening of June 7th for the Hawaiian archipelago. More precisely, their destination was the capital, Honolulu, located on island of Oahu. They departed from Haneda International Airport in Tokyo on board two airplanes. Both smiling, the two yokozuna, Asashoryu and Hakuho, boarded the first and the second flight, respectively. Hakuho, lately indeed a favourite of fortune, did not hide his joy, speaking as a yokozuna: "It's really nice that my first jungyo as yokozuna takes place abroad. I have heard that the Hawaiians can't wait to see us. 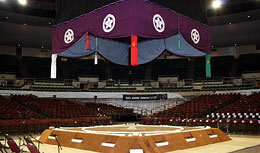 I will also be able to practice my dohyo-iri. I will do my best." He was also joyful as a very young man travelling with his parents: "This is the first time I'm going to Hawaii. I have only seen Hawaii in photos and on television, so this will be a discovery for me. I will eat a lot of tasty meals with my father and mother." Because of the time difference, the sumo delegation parted on the evening of June 7th and arrived in the United States on the same day. Scheduled for this first day, without delay, was, naturally, sightseeing. A stop at celebrated outlook spot, Nuuanu-Pali, was obligatory, and there, the rikishi quickly became targets for the cameras of Japanese tourists. After this jaunt, the ozeki (now only three after Tochiazuma's retirement and Hakuho's promotion) and the yokozuna presented themselves to the journalists for a press conference. 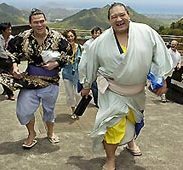 With the presence of famous wrestlers native to the archipelago, Azumazeki oyakata (former sekiwake Takamiyama) and the two yokozuna, Akebono and Musashimaru, Asashoryu expressed all-around enthusiasm: "Hawaii has given birth to glamorous yokozuna, and numerous Japanese live here. We all want to show them sumo that will please them." 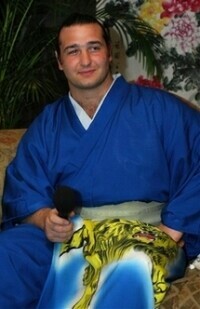 He also expressed his personal motivation: "I certainly intend to practice a powerful sumo." A large portion of the questions was aimed at Asashoryu's young fellow yokozuna, but Hakuho remained humble: "I'm a very fresh yokozuna and I'm still not completely at ease with my dohyo-iri. I will devote myself to it." For their parts, Azumazeki oyakata and Musashimaru oyakata, who had worked a lot with local businesses for the success of this jungyo, expressed the wish to see rekindled interest for sumo on their islands and new Hawaiian rikishi finding their places in the world of sumo. After the press conference, the rikishi were offered a dinner with dishes that were, indeed, a change from the usual offering from stable kitchens. In order to recover from the time difference and to honour the pleasures offered by the local geography, some wrestlers spent the Friday on Waikiki beach, each relaxing in his manner. Chiyotaikai had given them an example the day before, storming the beach the moment he checked in the hotel. "I have no intention of remaining cooped up in my room!" When Ushiomaru announced his engagement in May, Takamisakari, who turned 31, let it be known that he felt lonely and that he would gladly follow the example of his friend. Well, the maegashira from Azumazeki stable was not moping noticeably. In fact, he could be seen surrounded by young American water nymphs, obviously more familiar with bikinis than mawashi. Hakuho also enjoyed the pleasures of the beach. 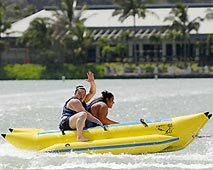 He treated himself to a ride on a "banana-boat" which proved a real test: "I gripped so hard not to fall, my hands were numbed. Finally, I let myself fall." Professional even with feet in the sand, the young yokozuna did not forget his training and had a dozen bouts against Ryuo, his compatriot from Miyagino stable. On the same day, the yokozuna and the makuuchi wrestlers gathered for a welcome reception, in which about 500 Japanese residents in Hawaii participated. Oshima oyakata, representing the NSK and responsible for organisation of the tournaments, and Mufi Hannemann, mayor of Honolulu, exchanged polite remarks. The first wished for great success of the jungyo and the second declared: "Japan is a very friendly country. We would be very honoured to have you come back again." The Neal S. Blaisdell Arena in Honolulu can accommodate an audience of 8,000. Only a little over 4,000 came to watch the Mayor's Cup. But they didn't spare the encouragement for the wrestlers, with Hawaiian newbies soon mixing their voices with those of Japanese fans. For Hakuho, this was the first dohyo-iri since his promotion. He didn't hide his lack of self-confidence, but in the end he presented an energetic dohyo-iri to the audience, among whom were his parents and sister. Since all the necessary tsukebito couldn't come to Hawaii, Ama, Aminishiki, Kyokutenho, Kasugao and Ryuo helped him put on his tsuna: "My dohyo-iri improves little by little. They tied the tsuna tightly, that gave me reassurance." 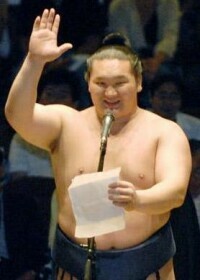 The victory went to Asashoryu, who defeated his junior in the finale by yorikiri. As the only yokozuna during twenty-one consecutive tournaments, he wanted to make the audience forget his relatively poor performance in Natsu basho, which he finished with his worst score in more than three years. From the first bout he put things straight, defeating Tochiozan by yorikiri, throwing Satoyama to the ground, lifting Takamisakari to push him out of the dohyo, and overcoming Kotooshu by yorikiri again. After receiving the Cup from the hands of the mayor of Honolulu, the Mongolian clearly indicated that he would do everything to seize the Sakura Cup the next day. Hakuho had shown some uncertainty in his first two yokozuna combats against Takekaze and Dejima, but then he proceeded to quickly dispose of sekiwake Kotomitsuki and ozeki Kaio, before losing the final 30-second long bout against Asashoryu. The ozeki also left good impressions. Kaio and Kotooshu reached the semi-finals. The popularity prize again went to Takamisakari. On the next day, 4,400 viewers were present, barely more than half of Blaisdell Arena's capacity, just like the day before. Asashoryu yielded against Kokkai in the second round. Hakuho asserted himself and won the Governor's Cup. On the way, he defeated five opponents, not one Japanese rikishi among them.. There were no Japanese left in the semi-finals either, which featured three Mongolians aged 22, 23 and 24. 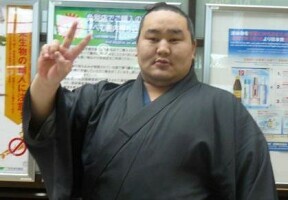 Their elder Asashoryu being 26, the new face of sumo seems to have decidedly central Asian traits. With Asashoryu's early disappearance from the tournament, it was his compatriot Ama who cleared a path to the finale, where, alas, he lost against Hakuho. Each having been the winner of one cup, the two yokozuna met again on the dohyo to decide the Sakura Cup. It seemed that good luck did not abandon the new yokozuna, who pushed Asashoryu out of the sacred circle by yorikiri, as flags in Mongolian colours flew in the galleries. 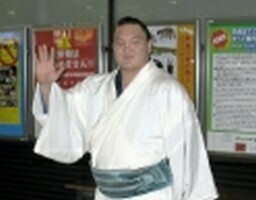 Delighted, Hakuho said: "This will remain a wonderful memory for me. I will draw self-confidence for the coming tournament from it. Swimming with dolphins was what left the deepest impression. 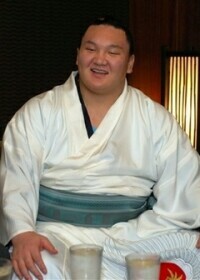 After such a good time, I really intend to do my best in the Nagoya basho." Hakuho closed this Hawaiian weekend by speaking a few words in English and even in Hawaiian on behalf of all the wrestlers. The jungyo balance sheet was far from bright. The Blaisdell Arena was filled, but only by adding together the audience of both days. Fourteen years ago, the same number of viewers attended on just one day. But back then, the rikishi included yokozuna Akebono, ozeki Konishiki and sekiwake Musashimaru, and today no Hawaiian rikishi came to replace them... Oshima oyakata could only yield in the face of the evident facts: "There was a problem in communication. When the wrestlers arrived in Hawaii, things started to move a bit." Too late. As the Taiwan jungyo and London koen are appearing on the horizon, and with Los Angeles, Mongolia and Singapore also candidates, he nevertheless remains positive: "We are optimistic for December. We have good relations with the other side (Taiwan)." photos and results (winners in bold) of the two tournament days.